Unlike reverse osmosis and distillation process, water filters are not limited in the type or size of contaminants they can remove. 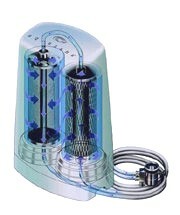 Thus, water filters are able to remove far more contaminants than any other purification method. Also, because they use the chemical adsorption process, water filters can selectively retain healthy trace minerals in drinking water. Filtration is the only one of the three water purification methods that is capable of removing chlorine, chlorine byproducts, and VOCs from drinking water. Chlorine and VOCs are the most dangerous and threatening contaminants of municipally treated drinking water. Besides the removal of these dangerous chemicals, water filters also extract from drinking water the chlorine-resistant protozoa giardia and cryptosporidium. These protozoa have plagued the water treatment industry for several decades and have caused a number of epidemics of severe gastrointestinal disease, contracted through drinking contaminated water. Water filters, because they do not require the costly energy sources of reverse osmosis and distillation, provide a source of relatively inexpensive, purified water. Also, water filters waste very little water, as compared to reverse osmosis and distillation systems. The following ratings starting with poor, fair, better & best. (in terms of contaminant reduction, NSF certification, price and performance). These comparisons are based on basic water filter technologies available on the market. Reverse Osmosis, Distillers and Water Ionizers are not included in this comparison. Depending upon the type of filter used, water filtration may be a less than ideal form of water purification. For example, granular filters do not utilize the chemical adsorption process, allowing several contaminants to pass through the filter media. Likewise, rapid water filters allot water inadequate contact time with the filter media, limiting the number of contaminants that may be removed. Solid block carbon filters solve both of these problems by using both adsorptive and slow filtration processes. Solid block carbon filters are absolutely the best and most effective water filters available. Poor– Pur, Brita, Zero, and all pitcher type water filters. These pitcher type filters are designed to do little more than filter out chlorine and lead. 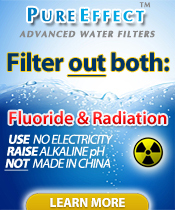 Most of these filters do not reduce contaminants, cysts, herbicides, pesticides, fluoride, or a multitude of other contaminants that may be in your tap water. Read the manufacturers literature for the full list of contaminants reduced and the level at which they are certified to reduce. Inconvenient to use: water must be poured through the filter and then refrigerated while you wait. Low capacity requires frequent filter changes. Must replace filters about every 40 gallons at $7-$10 each, or $130-$190 for 750 gallons. Fair– Pur, Brita and all faucet mount type filters. These type of filters mount directly to your faucet. Most of this type of filter will reduce chlorine, lead, cysts, mtbe, large particulate matter, and some other contaminants of health concern that may be in your tap water. Read the manufacturers literature for the full list of contaminants reduced and the level at which they are certified to reduce. Low filter capacity. Frequent filter changes needed, resulting in ongoing filter replacement costs. Must replace filters every 100 gallons at $20-$40 each or $140-$180 for 700 gallons. Better– GAC (Granulated Activated Carbon) Most models are designed to either sit on the counter top or under the sink. (some plumbing may be involved with under counter models). Granular Activated Carbon GAC water filters remove volatile organic chemicals (VOC), pesticides and herbicides, trihalomethane compounds, radon, solvents and many other chemicals found in tap water. Read the manufacturers literature for the full list of contaminants reduced and the level at which they are certified to reduce. These come in powdered or granulated form which allows water to flow around rather than through the carbon. Referred to as taste and odor filters because of the limited contact time the water has with the carbon. Can promote the growth of bacteria if not maintained properly. Price of repalcement filters vary depending on manufacturer. Filter changes aprox every 6 months. Best– Solid Carbon Block Water Filters. Materials are formed into a carbon block, which is densely compacted. Compression enhances the kinetics of the filter and provides performance that cannot be achieved with extruded or granular activated carbon (GAC) filters. Compacted solid carbon block filters have a large surface area for chemical/physical adsorption to take place. With a solid carbon block, the water contact time is longer and provides for greater adsorption of many different chemicals, pesticides, herbicides and certain heavy metals. In addition, the densely compacted carbon block mechanically filters particles down to 0.5 micron, including Giardia and Cryptosporidium, asbestos, turbidity and particulates. Solid carbon block filters are used in point-of-use drinking water treatment devices designed for countertop, undersink and inline applications. Must replace filters every 750-1200 gallons at $59.-$105 per year. (based on Multi-Pure’s replacement filter costs). Drinking water pollution comes from many sources. Surface water becomes contaminated from agricultural runoff, community landfills, polluted runoff (the nation’s leading cause of water pollution), and hazardous waste produced as byproducts of manufacturing. Groundwater is contaminated by leaks of pollutants such as gasoline and MTBE from underground storage tanks and injection of hazardous waste into deep wells (which is being phased out). The drinking water treatment industry is experiencing significant growth due to consumer demand for products that could protect them from these potentially harmful contaminants which may be found in drinking water supplies as well as aesthetically improve their water. Solid carbon block filters effectively treat the age-old contaminants of yesteryear, such as lead, TCE, chlorine, benzene and “new” contaminants found in the nation’s drinking water supplies today like MTBE, chloramines and PCBs. They also likely will be proven capable of significantly reducing contaminants that may be found in drinking water supplies in the future such as antibiotics and other drugs. The effectiveness of solid carbon block filters in treating a broad spectrum of contaminants of aesthetic as well as health concern makes it the technology of choice by distributors and more importantly, consumers throughout the country. As evidenced by independent laboratory testing and certification of solid carbon block filters, Only one company (Multi-Pure) has been successful in developing the technology to produce filters that provide greater chemical adsorption and mechanical filtration. Materials are formed into a carbon block, which is densely compacted. Compression enhances the kinetics of the filter and provides performance that cannot be achieved with extruded or granular activated carbon (GAC) filters. Compacted solid carbon block filters have a large surface area for chemical/physical adsorption to take place. With a solid carbon block, the water contact time is longer and provides for greater adsorption of many different chemicals, pesticides, herbicides and certain heavy metals. A close review of product listings confirms that Multi-Pure’s Drinking Water Systems are among the few that have been certified to reduce PCBs -a difficult contaminant to treat. Only a handful of products have been tested and certified to reduce a wide range of contaminants that are more difficult to treat. In addition, the densely compacted carbon block mechanically filters particles down to 0.5 micron, including Giardia and Cryptosporidium, asbestos, turbidity and particulates. Multi-Pure’s filter design incorporates an outer prefiltration medium to remove large particles and prevent premature clogging of the filter. Multi-Pure’s solid carbon block filters are exceptionally uniform and don’t channel or allow bypass. *All pricing information and performance data were acquired from national retailers, product manufacturers and/or promotional literature, and may vary slightly in certain areas. Many brands were reviewed and not included in this comparison due to unsupported performance claims. Some brands made various claims in literature and on company web sites that did not match the “certified claims” on the product’s “Performance Data Sheet”. Only performance claims that have been certified by NSF, UL or the Dept. of Health were considered in our comparisons. The water treatment industry is very heavily regulated. Companies that market uncertified products, or make uncertified claims are restricted as to how and where they can sell their products. Beware of companies that do not post Performance data on their websites, or offer different Performance Claims for different states. California, Wisconsin, Iowa, Massachusetts prohibit uncertified claims.